ACE Communications WA have been designing and building emergency phones for over ten years. From its first inception, to its current model, it has been improved upon and updated consistently. We rely heavily on feedback from our clients and a number of features and benefits have been added as a result of this feedback. The ACE Help Phone can be used in conjunction with any of the Australian GSM mobile networks. Neither trenching nor cabling is required. This makes the Help Phone ideal for remote locations or sites with difficult access for telephone or power cables. 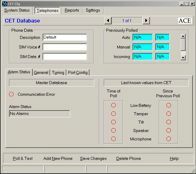 A software diagnostics package is available from ACE Communications WA, that enables complete remote control over every aspect of the ACE Help Phones.